GSMArena team, 11 March 2019. High-end features in a relatively affordable package. That's the vivo V15 Pro in a few words. 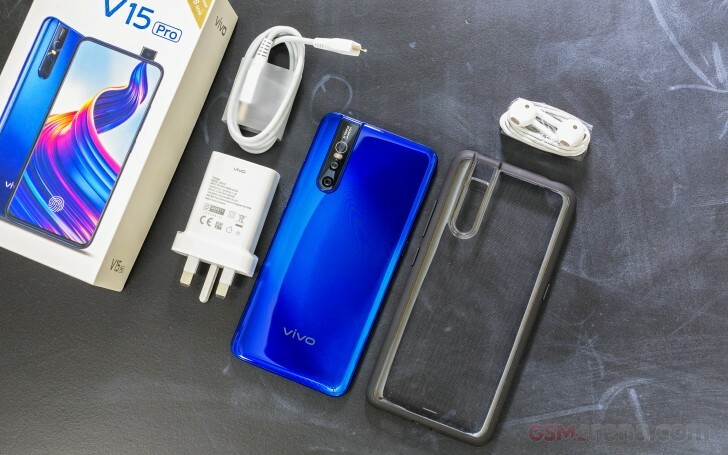 Or you can say that this phone is vivo's attempt to bring everything we love about the first vivo NEX to the masses. And thanks to the fast developing tech, we can even go ahead and say that in some aspects, the V15 Pro has outdone its more expensive sibling. Of course, besides the pop-up selfie cam and the under-display fingerprint, the V15 Pro still needs to keep the overall cost low to make the cut. That includes a mid-range SoC instead of a flagship one but that doesn't mean performance has been overlooked. The handset carries a perfectly capable Snapdragon 675 chipset and preliminary synthetic benchmarks suggest that it might be the spiritual successor to the beloved Snapdragon 660. And it should be more efficient as well given that it's based on a smaller 11nm node. Body: 157.3 x 74.7 x 8.2 mm, 185 grams, glass front, plastic back and sides. Screen: 6.39" Super AMOLED, 1080 x 2316px resolution; ~400 ppi. Chipset: Qualcomm Snapdragon 675 (11nm) chipset: octa-core CPU (2x2.0 GHz Kryo 460 Gold & 6x1.7 GHz Kryo 460 Silver); Adreno 612 GPU. OS: Funtouch 9 based on Android 9.0 Pie. Rear camera: 48MP f/1.8, 0.8µm, 1/2", PDAF support, Quad-bayer pixel array + 5MP depth sensor, LED flash; Ultra-wide: 8MP f/2.2; 1080p@30/60fps and 4K@30fps. Front camera: 32MP f/2.0, Quad-bayer pixel array. Battery: 3,700mAh, Dual-Engine fast charging 18W (9V/2A). Connectivity: Dual-SIM; LTE Cat.12 download/ Cat.13 upload, Wi-Fi a/b/g/n/ac, Dual-band MIMO, 2x2 antennas, GPS; Bluetooth 5.0 A2DP, LE, EDR, aptX, microUSB 2.0. Misc: Under-display fingerprint reader, motorized pop-up selfie camera. The camera department is where vivo thinks the V15 Pro excels so it would be interesting to see where the 32MP front and 48MP back cameras will take us. The ultra-wide angle snapper on the back is a bonus here and only tests will show how usable it really is. We've seen even flagships fail with the ultra-wide photography more than once. The handset comes in a standard retail bundle containing all the user manuals you'd normally find along with the microUSB (!) charging/data transfer cable and the charging brick itself. Vivo has also included a plastic case with silicone side bumpers for extra protection. It's compatible with the pop-up camera mechanism. The charger caps at 18W (9V/2A) so some kind of fast charging is at hand. Vivo calls it Dual-Engine fast charging but we'll have a closer look at it in the battery section.